Home / Tips/Tools / Certified Crane Care Tech Tips: Can We Talk? Certified Crane Care Tech Tips: Can We Talk? 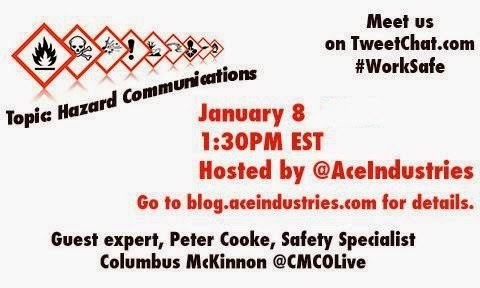 Hazard Communications standards from OSHA are the topic of discussion for our new #WorkSafe Twitter Chat launching this Thursday. Have you looked at the information your company disseminates about the hazardous materials used to meet your customer's needs? Whether you are a fabric maker in Dubai or an oil rig engineer in the middle of the ocean your company's information about the hazardous materials and environmental hazards are an important part of your day. Here is a list of helpful links for industries related to overhead cranes and hoists to help you find everything you may not know you need to #WorkSafe in your industry. Start with these organizations for help with finding what you need to know about Hazard Communications to #WorkSafe in 2015 and beyond. Certified Crane Care is here to help you with your overhead crane and hoist. Our expertise includes Fall Protection training, inspections, repairs, modifications and modernization to help your company meet and exceed your operation needs.